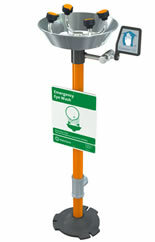 Application: Free standing, pedestal mounted WideArea™ eye/face wash. Four GS-Plus™ spray-type outlet heads deliver a flood of water over a wide area of coverage for complete rinsing of eyes and face. Bowl: 11 1/2" diameter. Bowl is stainless steel (FE704) or orange ABS plastic (FE704P). BC - Stainless steel bowl cover (FE704 only). Cover protects unit against contaminants. Cover is automatically raised when unit is activated. DC - Stainless steel dust cover for each spray head. SC - Self-closing ball valve. Note: Eye/face washes with self-closing valves do not comply with ANSI Z358.1 - 2004. TMV AP3600 - Thermostatic mixing valve precisely blends hot and cold water to deliver warm (tepid) water as required by ANSI Z358.1-2004. Refer to “Tempering Units” section for complete technical and product selection information. Application: Free standing, pedestal mounted WideArea™ eye/face wash. Unit has stainless steel cover to protect bowl from dust, dirt and other contaminants. Four GS-Plus™ spray-type outlet heads deliver a flood of water over a wide area of coverage for complete rinsing of eyes and face. Spray head assembly: Four GS-Plus™ spray heads. Each head has an internal flow control and filter to remove impurities from the water flow. Valve: 1/2" IPS chrome plated brass stay-open ball valve. 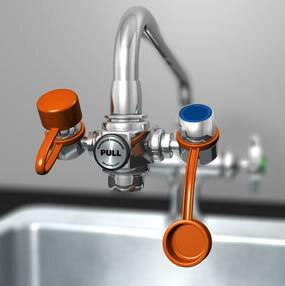 Valve is US-made with chrome plated brass ball and Teflon® seals. Valve is activated by flag handle or foot treadle. Unit remains in operation until handle is returned to closed position. Bowl: 11 1/2" diameter. Bowl is stainless steel (FE704HFC) or orange ABS plastic (FE704P-HFC). BC -Stainless steel bowl cover (FE704HFC only). Cover protects unit against contaminants. Cover is automatically raised when unit is activated. TMV - AP3600 - Thermostatic mixing valve precisely blends hot and cold water to deliver warm (tepid) water as required by ANSI Z358.1-2004. Refer to “Tempering Units” section for complete technical and product selection information. 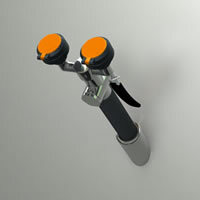 Spray head assembly: Two FS-Plus™ spray heads. Each head has a “flip top” dust cover, internal flow control and filter to remove impurities from the water flow. Bowl: 11 1/2" diameter. 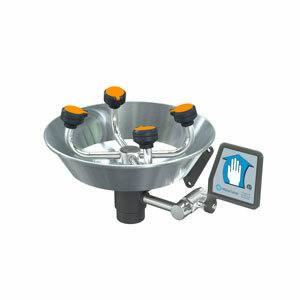 Bowl is stainless steel (FE760HFC) or orange ABS plastic (FE760P-HFC). BC Stainless steel bowl cover (FE760 only). Cover protects unit against contaminants. Cover is automatically raised when unit is activated. SC Self-closing ball valve. Note: Eye/face washes with self-closing valves do not comply with ANSI Z358.1 - 2004. Application: EyeSafe™ faucet-mounted eyewashes convert any faucet into an emergency eyewash station without interfering with normal faucet operation. 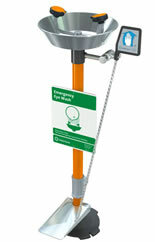 An EyeSafe™ unit can be installed at any sink, close to where accidents might occur. In an emergency, unit is quickly located and activated, and provides an unlimited supply of potable water for rinsing the user’s eyes. Outlet heads: Outlet heads are mounted 3" apart and deliver a soft, aerated flow of water. Heads angle forward toward user. Angle of heads is adjustable to permit full coverage and avoid splashing. Furnished with float-off dust covers to protect outlet heads. Valve: Forged brass diverter valve. 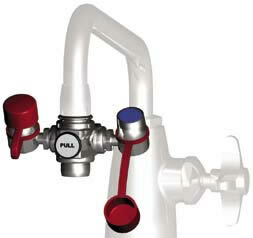 Pull knob to activate eyewash; water pressure holds eyewash in operation, leaving user’s hands free. Push knob or turn off faucet to return to normal faucet operation. Inlet: Body has 55/64"-27 female thread. Furnished with three adaptors (15/16"-27, 13/16"-27 and 3/8" IPS) for installing on most commonly used faucets, including laboratory-type faucets. Outlet: Furnished with removable aerator on bottom. IMPORTANT NOTE: Faucet-mounted eyewashes require two motions to operate (turn on water, pull knob to activate eyewash flow). Therefore, it is not believed that these units meet the provisions of ANSI Z358.1-2004 as eyewash units. These units are intended solely as supplemental units in addition to dedicated, plumbed eyewash equipment installed in the workplace. NOTICE: Faucet-mounted eyewashes should be used with cold or warm water only. Use of hot water might cause scalding. AP400-012 -Inlet adaptor with 13/16"-24 female thread. Application: WideArea™ eye/face wash for wall mounting. Four GS-Plus™ spray-type outlet heads deliver a flood of water over a wide area of coverage for complete rinsing of eyes and face. Bowl: 11 1/2" diameter. Bowl is stainless steel (FE724) or orange ABS plastic (FE724P). GRN - Green ABS plastic bowl. YEL - Yellow ABS plastic bowl. 1 1/2" IPS waste connection. TP - 1 1/2" OD chrome plated brass tailpiece. Application: Eye/face wash for wall mounting. Two large FS-Plus™ spray-type outlet heads deliver a flood of water for rinsing eyes and face. BC - Stainless steel bowl cover. Cover protects unit against contaminants. Cover is automatically raised when unit is activated. TMV - AP3600 - Thermostatic mixing valve precisely blend hot and cold water to deliver warm (tepid) water as required by ANSI Z358.1-2004. Refer to “Tempering Units” section for complete technical and product selection information. HS- Auxiliary hand-held drench hose for rinsing eyes, face or body. O-ring seals. Swinging head assembly from storage to operational position opens on force and activates water flow. Unit remains in operation until head assembly is returned to storage position. Mounting: Unit may be mounted on right side (EW805) or left side (EW805LH) of sink. Furnished with mounting shank, positioning lugs, locknut and washer for securing unit to counter. LH - Left hand mounting. TMV AP3600 - Thermostatic mixing valve precisely blends hot and cold water to deliver warm (tepid) water as required by ANSI Z358.1-2004. Application: Eyewash for mounting on counter next to sink. Spray heads swivel 90 degrees from storage to operational position. Water flow is activated by flag handle. Mounting: Unit may be mounted on right side (EW806) or left side (EW806LH) of sink. Furnished with locknut and washer for securing unit to countertop. 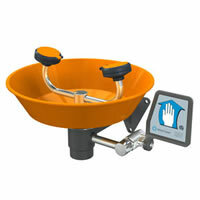 Application: AutoFlow™ eyewash for mounting on counter. Spray heads swing down from storage to operational position, activating water flow. Available in a variety of spray head configurations to minimize obstructions at a sink. Note: If unit is not installed at a sink, floor drain should be provided underneath unit to prevent accumulation of water on floor. O-ring seals. Swinging head assembly down from storage to operational position opens orifice and activates water flow. Unit remains in operation until spray head assembly is returned to storage position. Mounting: Valve is installed in Type 316 stainless steel housing. Mount housing on wall using anchors or other mounting hardware. TMV AP3600 thermostatic mixing valve precisely blends hot and cold water to deliver warm (tepid) water as required by ANSI Z358.1-2004. ANSI Z358.1 - 2004 as both an eyewash and a drench hose. 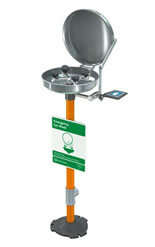 Unit may be left in the mounting bracket for use as a fixed eyewash, leaving user’s hands free. Alternatively, unit may be removed for use as a drench hose to rinse any part of user’s eyes, face or body. Hose: 12' reinforced nylon retractable coiled hose. 180 PSI maximum working pressure. Mounting: Bracket with spring clips to hold unit on wall. Clips assure that spray heads face forward at all times. Backflow preventer: In-line dual check backflow preventer installed on inlet of hose (EW1014BP only). Note: Check with code authority for compliance with local plumbing code. BP - In-line dual check backflow preventer installed on inlet of hose. Note: Check with code authority for compliance with local plumbing code. DC - Stainless steel dust cover for spray head. VB - In-line vacuum breaker for installation between valve and spray head. Application: Dual purpose eyewash/drench hose for deck mounting. Unit meets the provisions of ANSI Z358.1 - 2004 as both an eyewash and a drench hose. Unit may be left in the deck flange for use as a fixed eyewash, leaving user’s hands free. Alternatively, unit may be removed for use as a drench hose to rinse any part of user’s eyes, face or body. Mounting: Deck flange for countertop mounting. 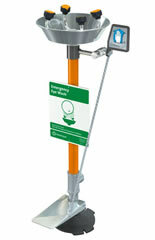 Flange has handle locator guide to position spray heads and handle facing forward at all times. Backflow preventer: In-line dual check backflow preventer installed on inlet of hose (EW1022BP only). Note: Check with code authority for compliance with local plumbing code. Supply: 3/8" NPT male swivel-type inlet. FSH - 8 ft. flexible stainless steel hose in place of PVC hose. HG - Undercounter hose guide bracket to prevent hose from tangling or binding. 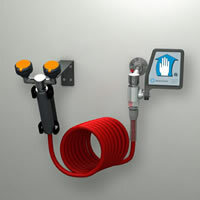 Application: Dual purpose eyewash/drench hose unit for wall mounting. Unit meets the provisions of ANSI Z358.1 -2004 as both an eyewash and a drench hose. 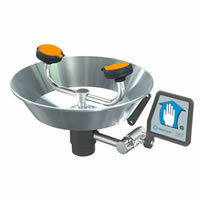 Unit may be left in the angle holder for use as a fixed eyewash, leaving user’s hands free. Alternatively, unit may be removed for use as a drench hose to rinse any part of user’s eyes, face or body. Mounting: Angle flange for 45 degree panel mounting. 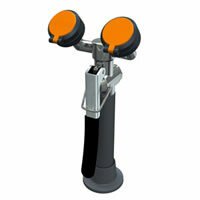 Flange has handle locator guide to position spray heads and handle facing forward at all times. Backflow preventer: In-line dual check backflow preventer installed on inlet of hose (EW1041BP only). Note: Check with code authority for compliance with local plumbing code.